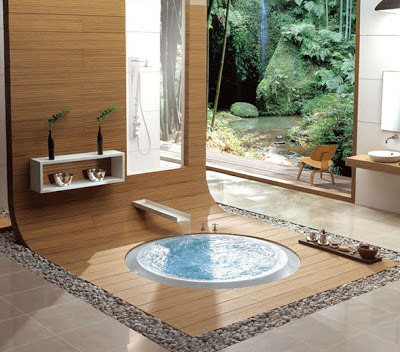 The first step to creating a Zen bathroom is to make sure the floor plan flows smoothly. Although zen is not a proper design style and does not come with a book of strict rules, it is often associated with simplicity and purity of lines. It is rather a way of arranging your home and creating an atmosphere that offsets the stress and hassle of your daily routine. Homeowners starting from scratch may want to remember that the bathtub works best when installed by a window in order to allow individuals to feel at one with nature while soaking. The view from the bathroom should be calm and attractive - if this is impossible, lush plants should be placed nearby in order to facilitate a feeling of connecting with nature. The bathroom should interact with adjacent rooms so that the view looking in and out of the bathroom is appealing and serene. The toilet area should not be seen from the doorway. Consider placing a beautiful piece of artwork within viewing distance of the toilet; let that art be the focal point from the doorway. Additionally, it's important to keep all of your surface areas clean, which may require purchasing a deeper medicine cabinet or a set of drawers. The zen approach is that of a minimalist, the less over stocking and stuff, the better for your design. If you still don't have enough space, consider using woven reed boxes or baskets, two beautiful options which can also weather the steam from your shower. The thought of clutter free spaces and relaxation comes from the Japanese culture’s take on mental health and well-being. As well you will want to use as many candles as you'd like and don't be afraid to incorporate plenty of stones, flowers and other natural earth elements to give your zen inspired bathroom a perfect ambiance. Finally, make sure your color scheme matches your new accents and fosters a feeling of relaxation. Go for the natural color scheme and stick to greens, browns, beiges and blues. If you're distracted by toiletry bottles, consider replacing them with decorative ones that blend into your tile or walls. Using naturally scented soaps, oils and bath salts can add to a more soothing experience and are a must in a Zen bathroom. All that's left to do is sit back, relax and let the stress melt away.